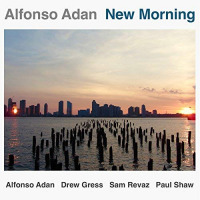 New Morning is an album recorded with Alfonso Adan on guitars and production, Drew Gress on double bass, Sam Revaz on piano, and Paul Shaw on drums. It has twelve original compositions that are played within a modern and innovative jazz context. In this album, Alfonso develops a new style in a modal and poly-modal compositional frame in which he simultaneously uses double harmonies, creating different colors and expectations within the avant-garde jazz world.